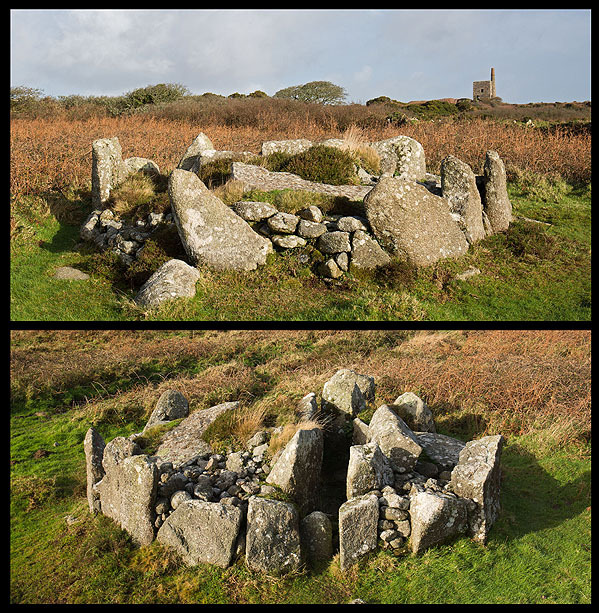 A Kerbed Cairn 5m diameter x 1.2m high with a Chamber 1.5m long x 0.7m wide. The Entrance passage is positioned to face the midwinter solstice sunrise. Location - West Cornwall - Lands End Penninsula / West Penwith. A footpath from the road just north of Lanyon Farm to the Ding Dong mine passes the Cairn. As the path levels out and reaches a metal gate , with another metal farm gate near by / take the track to the right - the cairn soon appears with Ding Dong and a green field behind.